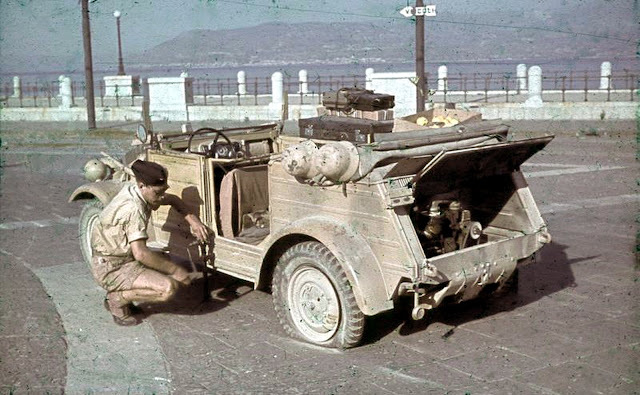 A German driver operating a jack in changing a flat tire on a Kübelwagen Typ 82 (with engine visible) in Sicily, Italy, 1943. This picture was taken by Kriegsberichter from Kriegsmarine, Horst Grund. It reproduces the waterfront of Messina (over the sea coast of Calabria) in the afternoon (the sun from the west) summer. Kübelwagen is an abbreviation of Kübelsitzwagen, meaning "bucket-seat car" because all German light military vehicles that had no doors were fitted with bucket seats to prevent passengers from falling out! The first VW test vehicles had no doors and were therefore fitted with bucket seats, so acquiring the name VW Kübelsitzwagen that was later shortened to Kübelwagen. Mercedes, Opel and Tatra also built Kübel(sitz)wagens.